To me, collecting proof cards represents the best ways to acquire examples of the Star Wars packaging art in its purest form – without the card art being obscured by figures, bubbles and coins. The proof card market is buoyant with many collectors seeking a run of proof cards or maybe just an example of their favourite card or character – this keeps the market active and prices fairly steady. In basic terms a proof can vary in price from maybe $150 to $5,000 – quite a range! Generally, speaking Star Wars and unproduced POTF proofs are the most expensive, while Revenge of the Jedi and Return of the Jedi are the least costly. 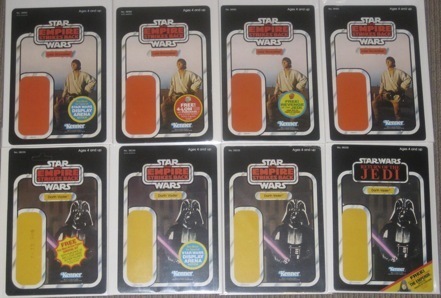 Of course there are exceptions – A Revenge Boba Fett or Return of the Jedi Luke Skywalker may fetch a similar figure to a POTF card, as may other popular characters on relatively common card types. 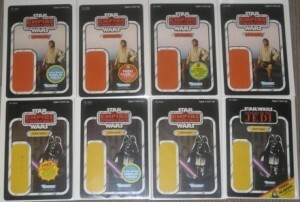 Any Luke Skywalker, Darth Vader or Boba Fett will fetch a reasonable price as those who may only seek one proof for their collection would perhaps prefer a marquee character as their example of a proof. Likewise, some proofs which complete a run or set exist in very small numbers (for example 6 of the 12 back proofs exist in less than a handful) so multiple collectors would try and purchase these for their collections should they come up for sale – pushing the price up. 48-back Revenge proofs are an excellent entry point into proof card collecting as it is possible to collect a full set of 50 and around half of the cards can be bought for under $200 (or less as a bulk deal), so while yu might not be able to buy a set in a couple of weeks, with some patience it is possible. Some other sets, unless you are Warren Buffet, are near enough impossible, even though each card is known to exist. Some people look for an example of each proof card type, or card front. Again this is a nice strategy as you have a number of readily available proofs and only a handful which are big-ticket items. When buying proofs (and any expensive prototype item) it is important to ‘buy the seller’ rather than the proof – as fakes and reproductions do exist. If you are getting a rare proof at an excellent price you need to STOP and ask yourself WHY! Most importantly – pace yourself, realise that you probably won’t complete your goals overnight and ENJOY being involved in this cool facet of vintage Star Wars collecting! Proofs and Cromalins can be expensive purchases and form the centrepiece of a collection, or they can bethe collection. In either event, as items which are long out of production and part of toymaking history they should be looked after as well as enjoyed. The best was of preserving a proof or cromalin would be to lock it away in a humidity controlled store, with zero daylight. While this may work for museums it is impractical for most collectors and there is little fun in locking away something you saved hard to buy, so there are viable alternatives which are almost as good. Ultraviolet (UV) radiation is the enemy of artwork; be it a painting, photograph or proof card – UV light is bad. Any strong light can be bad for the colours and vibrancy of a piece, but UV is the most damaging. Natural daylight contains UV lightwaves as does some house lighting, so minimising this is the first step to protecting your collection. UV filtering window film can be purchased and placed over windows which allow light into your collection or, if this is unfeasible, UV glass can be specified in display cases or UV acrylic in custom cases you might use. If you frame proof cards (see below), then UV glass (or acrylic) can be specified for the frame. Of course, an alternative is to black out your windows and only open the blinds when you are in the room! Incandescent lighting appears to be the method with least harmful UV radiation given out. Fluorescent lighting tubes appear to give off the worst levels of UV radiation. The materials used in framing should be ‘Acid-Free’ at an absolute minimum and ‘conservation’ ideally. Acids in paper (the mount and backing of the frame) can migrate to the proof and cause yellowing and discolouring. Conservation and ‘buffered’ materials absorb acids which may already be present in the proof and prevent them causing discolouring or other damage. The proof should be secured to the frame by a totally reversible means, and ideally not be glued or tacked in any way at all and should certainly not be in direct contact with the glass, as very small levels of moisture present could stick the proof to the glass! Assuming the room is somewhat protected from UV radiation there are several methods of storing and displaying proof cards. Acrylic star cases are popular and a good storage method, providing the design does not damage the square bottom corners. UV material is available, although expensive if you have a lot of proofs, and can be used if you are unable to otherwise UV protect your collection. Some people send proofs to AFA who encase them and grade them – verification of rare items can be important but, to me, the cases are a little too bulky for proof cards. A number of collectors use 6×9 acrlyic ‘toploaders’ to store proof cards. These are a hard plastic, open topped pocket which the proof drops into. The sizing is perfect providing for a very tidy looking display, but the fit is very tight, so any dust or grit in the toploader (which cannot be sealed) may scratch the proof. Comic bags can be a reasonably cheap method of storing multiple cards, and take up limited space. There are a number of different type of comic bags, from cheap polythene bags to acid free Mylar bags with conservation backing cards, the latter combination of which provide an excellent method of storing proofs – although provide little physical protection so the full bags will need careful storage.